BAM, BRIGIDIM, BIF!!! Bam goes Wicked Eleven! BRIGIDIM goes Sunrise! BIF goes Brilliant! After a hard and well fought fight, Easy Does It is now the undisputed King of Cricket in the Belize River Valley. 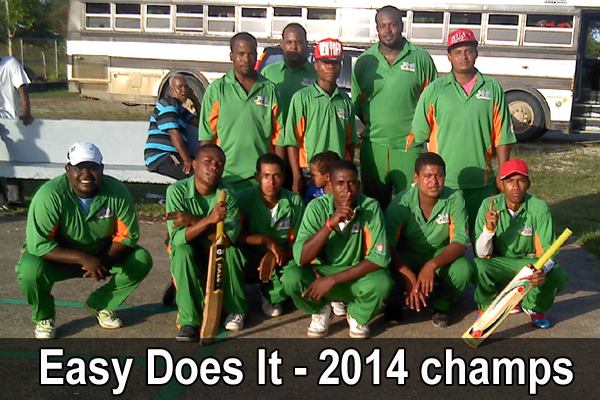 To be precise, Lemonal Village (is home of the 2014 Harrison Parks National Cricket Competition Champion). After the games started in February, Easy Does It won all their games in the (double round-robin) regular season by beating all opponents two times, except for Western Eagles of Rancho Dolores and Excellence of Double Head, only one time. These are the teams that they faced and devoured, not by this order: Excellence, Excelsior, Brave Eleven, Western Eagles, Police and Bright Star. At the start of the competition, this team was not a favorite of a lot. Insulting remarks were thrown at them. Some really made fun of them. Some of them were rough on the team, who were thought of as being friends or family. They endured all negative things hurled at them. They stayed the course with the help and support of a few “die hard” fans, family and friends. 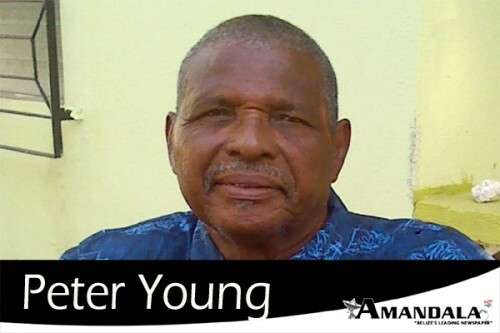 Wherever they traveled, you would see their crowd following; people like Ephraim “Dabo” Banner, his wife and children; Bengy Reynolds, he has four sons playing, including Kenroy, the captain; Miss Victorine “Maza” Beng; Wayne, Soapy, Kenyon, Lugy, who is a playing member of the team, Tony, Tash and a few more that stood fully behind them from the beginning. Last, but not the least, Michael Muslar, who everyone could hear shouting, telling his team how to bat, and how to bowl who. He is the appointed coach for the team. Umpire Calbert “Cally” Banner looks over shoulder of Brilliant bowler Andrew Banner as he delivers to Easy Does It opening batsman Warren “Bom Jones” Anthony. Brilliant wicket keeper is Raynard Tillett, and other Easy Does It batsman looking on at the far end is Malcolm Reynolds. Mr. Muslar is being congratulated for his hard work with this team. He has done a splendid job in making Easy Does It champs. Well done, Michael. The manager of the team, Leroy Banner, must also be praised for his behind the scene work. I have not seen a manager of that magnitude. You have displayed professional standard that others should follow. You too, sir, well done! I should also mention, Muslar has a son playing too, and he is a star on the team too. In getting to the championship spot, Easy Does It defeated three very strong teams – Wicked Eleven, Sunrise, then Brilliant. 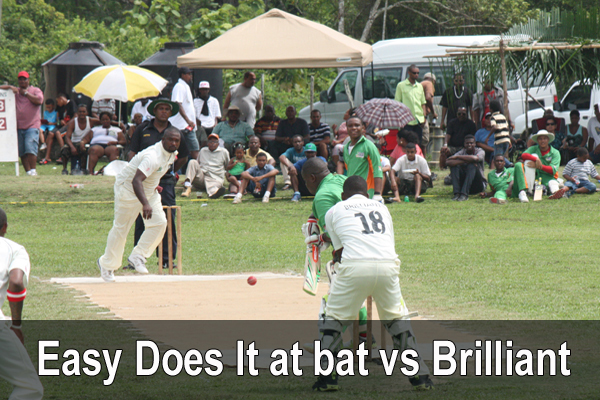 On Saturday in Lemonal, it was a “do or die” game for the visiting Brilliant. At the end, Brilliant died. They did not go down that easily, for the game was not finished in one day; it took part of Saturday and part of Sunday. It is a game that will go down in history. Take a look at the picture of two rivals from the same village in charge of different teams. There’s Lawrence Banner on the left, captain of Brilliant, and on the right, Kenroy Reynolds, captain of Easy Does It. These two men put in all their effort, trying to get the cherries; but at the end, only one could have gotten it, and that’s Easy Does It. These two men are of the Lemonal soil. They could be related, but I don’t want to be off the mark too much. During this specific game, I did not see any of these men yield in any way to make space for the other to win. Both men were professionals. Andrew Banner, Brilliant bowler, bowling at his son, Andrew, Jr., he put everything he had to try and get his son out. He got him, after the son went for a trick ball and he was caught. After the game, both captains shook hands. It was a bitter sweet moment. Lawrence to Kenroy – Congrats friend! You have done a great job in defeating us. Well done, and keep it up. With the way he speaks, and the look on his face, tells just how he felt after losing. Anyway, he took it like a man, as he is. Kenroy to Lawrence – Congrats to you too, friend! You too have done a good job. You all played very well. I could remember some games that I would go watch in Lemonal. One could always see Miss Olive and Cherry inside the kitchen trying to get food in readiness for visiting teams. Around inside is Breena, daughter of Miss Olive. I am not forgetting Maza; Cousin Florence, very much in age, but a strong follower of the team; Michael Muslar’s wife and her sisters, always on the sideline cheering. There are more names I would want to mention, but I’m not sure if they were on board all the while, or just hopped on for a finished ride. The ending of the game went this way. Easy Does It batted first and scored 153, with Aaron Muslar and Malcolm Reynolds making 38 and 31, respectively. Kenroy Reynolds and Myckelt Anthony took 4 wkts each. When the first wicket fell for one run, loud cheers could be heard from Brilliant’s crowd. A large crowd of their fans came out to see the game. The 2nd wicket was for 45; then 3 for 57; 4 for 82; 5 for 98; 6 for 115; 7 for 130; 8 for 137; 9 for 150; 10 for 153. After a short break, it was time for Brilliant to try and cover the score. At the very starting of the second half, things did not look good for Brilliant. The wickets started falling in this order: 1 for 1; 2 for 1; 3 for 2; 4 for 13; 5 for 37; 6 for 51. Six o’clock came and the game was stopped, to be continued on Sunday. Sunday, not so big a crowd was present as on Saturday. Anyway, the rest of Brilliant team arrived; not the full team, and not much of their fans. The game continued in this order: 7 for 74; 8 for 78; 9 for 85; all for 85. This brought the competition to a pleasant ending for the home team. What a joyous crowd that ran out to congratulate and greet their heroes! It also ended the cricket season. For Brilliant, Lawrence Banner and Shane Westby scored 19 and 13 runs, respectively; and Arturo Wade and Lawrence Banner took 4 and 3 wickets, respectively. Hopefully, other events could be had, if nature allows. My own personal comment to Easy Does It – During the season, you were looked upon and talked about as “the lee team from Lemonal.” You are no more the little team. You have defeated all the big teams you met. Congratulations to you all, and may you keep the fire burning! God bless each and every one of you. Respect to all. Bye.